Traveling in Italy can offer you some of the most incredible vacation experiences of your life. Whether you choose to spend your time absorbing the atmosphere of one of the great art cities, exploring rural medieval towns, or basking on a beach, you’re in for a wonderful treat. Italy offers all kinds of vacation accommodation: a 15th-century monastery, resort hotels beside the sea and lakes, business hotels, and simple inns and guesthouses. But hotels aren’t the only option. You can rent an agriturismo farm cottage in Tuscany, an apartment in a medieval building in Palermo, or a room in one of those curious domed trulli houses in Alberobello. Although you’ll find hotels that you’ve probably heard of, you’d be missing out on a lot if you stick to only the Best Westerns and Hiltons. Italy has more than 3,500 museums, art galleries, and archeological sites. Although most museums and galleries are usually closed on Mondays, opening hours are not uniform. Enquiries should be made at tourist offices or the museums themselves. Store opening hours vary from region to region. In general, though, stores are open from 8.30 a.m. until 12.30 p.m. and from 4.30 or 5 p.m. until 8 or 8.30 p.m. from Monday to Saturday. They are often closed on Monday mornings. Large department stores tend to remain open all day, as do shops in tourist centers–these may remain open all day and sometimes until late in the evening. (In Alghero, Sardinia, many jewelry stores don’t close until 11 p.m. in summer.) 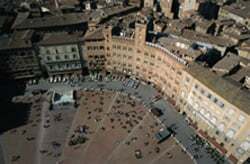 Shops where you can buy typical products with the “made in Italy” label (clothing, leather goods, shoes, jewelry, art objects) are usually located in the historical centers of cities. Via Montenapoleone and Via della Spiga in Milan, Via del Corso and Via Condotti in Rome, Via Toledo in Naples, and the shops on the Ponte Vecchio in Florence are famous worldwide. If you’re seeking clothing bargains, check out the chain stores.